Some people may wonder why did Christ after resurrection, ascended to heaven and sat on the right hand of the Father?! To answer this question we have to understand why did He come in ﬂesh and lived amongst us as a full man, then why was the cruciﬁxion, burial and resurrection, then the ascension and the sitting on the right hand of the Father?! Beloved, that is what is known to the fathers as the divine plan of salvation. And it is known to the Holy Trinity before the founding of the world. Listen to what saint Peter say about the blood of Christ which was shed on the cross after incarnation, he says” knowing that you were not redeemed with corruptible things, like silver or gold, from your aimless conduct received by tradition from your fathers, but with the precious blood of Christ, as of a lamb without blemish and without spot” ( 1 Peter 1:18-19). We know how through the disobedience of God came the fall of Adam and Eve the mother of humanity, and how disﬁgured Adam became from what he was created upon before the transgression and the entrance of death to him and us. And the man has fallen in Adam and Eve after they were expelled from the presence of the Lord, walking in the path of death, including all the human race with them. And from the ﬁrst moment God revealed His plan for the salvation of the human kind, speaking to the old serpent and saying” And I will put enmity Between you and the woman, And between your seed and her Seed; He shall bruise your head, And you shall bruise His heel.” ( Genesis 3:15). Translating salvation by sacriﬁce to cover the shame of sin referring to the sacriﬁce of His Only begotten Son, Jesus Christ on the cross” Also for Adam and his wife the Lord God made tunics of skin, and clothed them” ( Genesis 3:21). This is how God planned the salvation of the human race, to descend from heaven and unite with our human body in everything except sin which has entered to us through the temptation of satan, resembling us in everything else as a human, taking all our sins since Adam and until the end of time, and carrying them on His holy sinless body, becoming a sin for us to become God’s righteousness in Him, and He was cruciﬁed on the Cross, on which the cursed were hung according to the Law, lifting the curse and granting us the Father’s blessings and the works of the Holy Spirit in us, dying as the righteous, eliminating death by His death and ending the rule of sin on us. He then resurrected from the death which couldn’t hold Him, for He is the Resurrection and the Life, so we rose in, by and with Him. And here He had to lift us to the Father with Him, He whom we had parted from since Adam’s fall, wearing Christ through faith, acceptance and baptism in the name of the Holy Trinity” For as many of you as were baptized into Christ have put on Christ” ( Galatians 3:27). And when the Father sees us in Christ, He happily opens His arms and say this is my beloved Son, in Whom I am well pleased, seeing the salvation of all humanity by His Son’s blood and saying to the ﬁrst Adam” for this my son was dead and is alive again; he was lost and is found.’ And they began to be merry” ( Luke 15:24). And this would be the perfect joy. 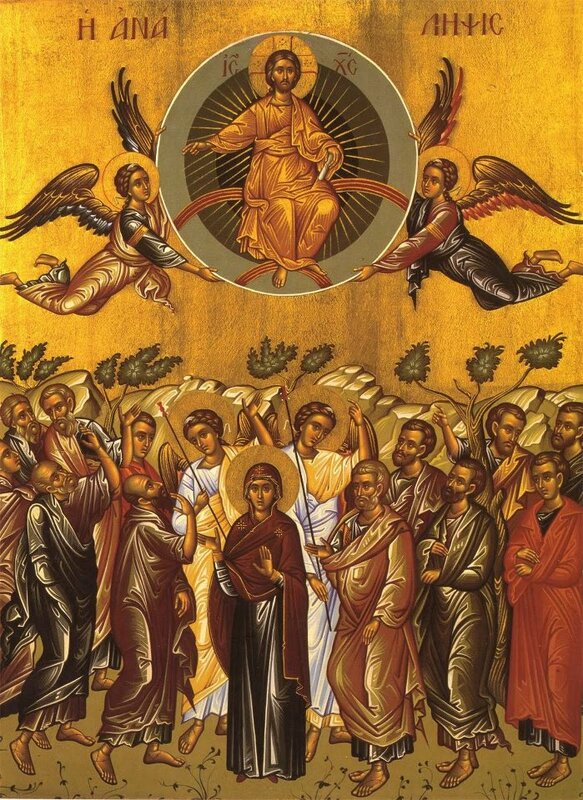 Therefore, after incarnation, death and resurrection, Christ had to ascend to heaven to bring before His Father the new humanity in Him, justiﬁed in His blood and clothed in righteousness, accepting her in His son and sitting her on His right hand. In Jewish traditions the oldest son sat on the right hand of his father, referring to his preciousness and his father’s love towards him. Christ had to ascend to offer us as a bride to her heavenly Groom, praising in joy” the voice of joy and the voice of gladness, the voice of the bridegroom and the voice of the bride, the voice of those who will say: “Praise the Lord of hosts, For the Lord is good, For His mercy endures forever” ( Jeremiah 33:11). It suits us my beloved to know that when the Lord had ascended, He ascended us in Him, for He is eternal, yet He descended, was incarnate, died, resurrected and ascended for us, being united with our humanity in a bond that is eternally inseparable. We then get to understand what was prophesied in the Old Testament about the coming of Christ. Peter testiﬁes saying” For David did not ascend into the heavens, but he says himself: ‘The Lord said to my Lord, “Sit at My right hand, Till I make Your enemies Your footstool” ( Acts 2:34-35). The sitting on the right had of glory in heaven was not attainable except through Christ after fulﬁlling what the Father sent Him to earth to fulﬁll, Jesus Christ declared that on the cross when He said” It is ﬁnished” ( John 19:30). And this is what Saint Paul afﬁrms when he speaks about Christ saying” who being the brightness of His glory and the express image of His person, and upholding all things by the word of His power, when He had by Himself purged our sins, sat down at the right hand of the Majesty on high” ( Hebrews 1:3). The right hand of the Father does not mean that God has a right and a left hand, but it shows the greatness of Christ and us in Him when we believe. Listen to this wonderful promise from the Lord in the Book of Revelation” To him who overcomes I will grant to sit with Me on My throne, as I also overcame and sat down with My Father on His throne” ( Revelation 3:21). Observe dear reader what glory and pride are for us in Christ, who ascended to prepare an indescribable great place for us to be with Him in His and His Father’s kingdom. Do we now understand the meaning of the right hand of the Father?!. Doesn’t that drive us to look up with our eyes and hearts, longing for the moment where we meet ?! Doesn’t that drive us to stick to the Lord our savior in the midst of all the perishable world’s temptations and its uncleanliness and false illusions that lead us away from the Holy Trinity?! Don’t we know that we do not have an everlasting place here on earth but we seek what is above, where Christ who sits on the throne of glory is, He who has prepared for us a place and will come and take us to sit on the right hand of the Father in the heavenly kingdom, so we can enjoy what the eye has not seen and the ear has not heard?! While we live in the glory of resurrection, ascension and the sitting of the Lord on the right hand of the Father in heaven, let us focus on saint Paul’s words and live it day by day” If then you were raised with Christ, seek those things which are above, where Christ is, sitting at the right hand of God. Set your mind on things above, not on things on the earth” ( Colossians 3:1-2). If we commit ourselves to these life-giving verses, we would be ready for the groom when He comes and asks us to go with Him” For you died, and your life is hidden with Christ in God. When Christ who is our life appears, then you also will appear with Him in glory” ( Colossians 3:3-4). We long for sitting in Christ on the throne of the Father, where in Him, all the enemies will submit under our feet, satan, death, tears, pain, sadness, sighs, screams, darkness and all evil, replaced by indescribable joy, praising in the presence of the unapproachable Godly light, where angels and archangels worship the One who sits on the throne with us praising and saying:Holy, Holy, Holy Lord of hosts, Thine is the glory the blessings and the majesty O, Lord of Lords. And we shall be in fullness where there is no hunger, quench any thirst and and the peace of God, which surpasses all understanding, will guard your hearts and minds through Christ Jesus.Amen.